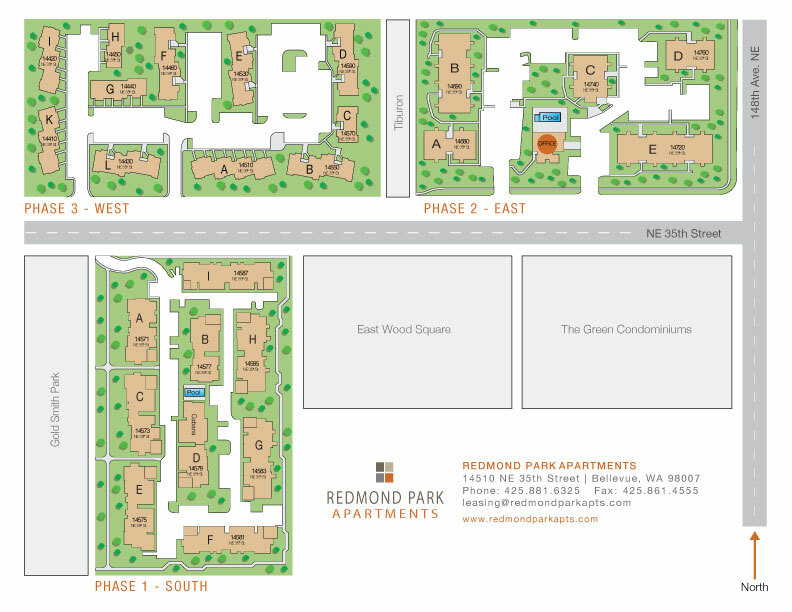 Redmond Park Apartments in beautiful Bellevue, WA offers great apartment homes & townhomes in the perfect location. Our Bellevue apartments and town homes – adjacent to Goldsmith Park and directly across the street from the Microsoft campus – are surrounded by lush landscaping and soaring trees, feeling as if you are in the secluded country. But with businesses, great shopping and dining close by in downtown Redmond and at Redmond Town Center, you never feel far from anything. Each apartment home provides spacious floor plans, modern kitchens, designer touches, and plenty of storage. Enjoy fabulous amenities as well, including outdoor pools, fitness centers and business lounge. Redmond Park is a 260 apartment home community. Beautiful apartment and townhomes in Bellevue, WA, close to major employers and great shopping and dining.